Being that today’s February 1st, I figured it was close enough to Valentine’s Day so that I could do a Valentine’s design. I’m not a big sappy “Hallmark Holiday” kind of girl, but I had a few of the Sinful Colors 2011 Valentine’s collection to show you, so what the heck. For this manicure, I used one coat of OPI’s Natural Nail Base coat, two coats of Sinful Colors Boom Boom, Sinful Colors Black on Black for the Tips, Sinful Colors Soul Mate for the heart halves on all but the index and ring fingers, on which I used Sinful Colors Beautiful girl (they look identical more on that later), Sinful Colors Snow Me White for “Love” and Sinful Colors Sweet Treat for the red inside of the middle finger heart. I topped off with one coat of Seche Vite. Now. I usually H.A.T.E pink. I’m just not a pink/purple fan, but I LOVE Sinful Colors Boom Boom. It’s a squishy creme, aka sort of like a jelly but a little more opaque. It has MASSIVE shine after two coats and (GASP) I would wear it alone. I’m a bit edgy though so I really LOVE the black tips. Even though its pink, it wasn’t “Valentine’s Sweet” enough yet so I added the heart halves and the “love” on the middle finger. Soul Mate is a bubble gum pink creme that well, was an absolute pain to do nail art with. I hate saying that because I tried to like the formula and I LOVED the formula on Boom Boom, but it was lumpy, wouldn’t spread well, and when thinned just a little (out of the bottle), got so thin that I had to let it thicken up again to work with it. Beautiful Girl was a tiny bit easier to apply but they’re so close in formula and color, that if I were at the store, I wouldn’t buy both. Beautiful Girl is slightly warmer and lighter, but barely. My suggestion for you if you like the shade is add a few drops of thinner into the bottle as soon as you purchase it and it will apply like a dream. After I did that, it was MUCH easier to work with. I like Soul Mate and Beautiful girl though because unlike other bubble gum pinks, they’re slightly dusty and great neutrals if you wear them alone. They remind me of a strawberry shake. Also, still job searching so I hope you understand my random posting and then going MIA. I’ll post as much as possible but graduation is coming up quickly and Rafik and I are really in high gear trying to get our lives figured out. Some of the products in this post were provided to me for consideration and review by the manufacturer. For further information, please see my disclosure statement. 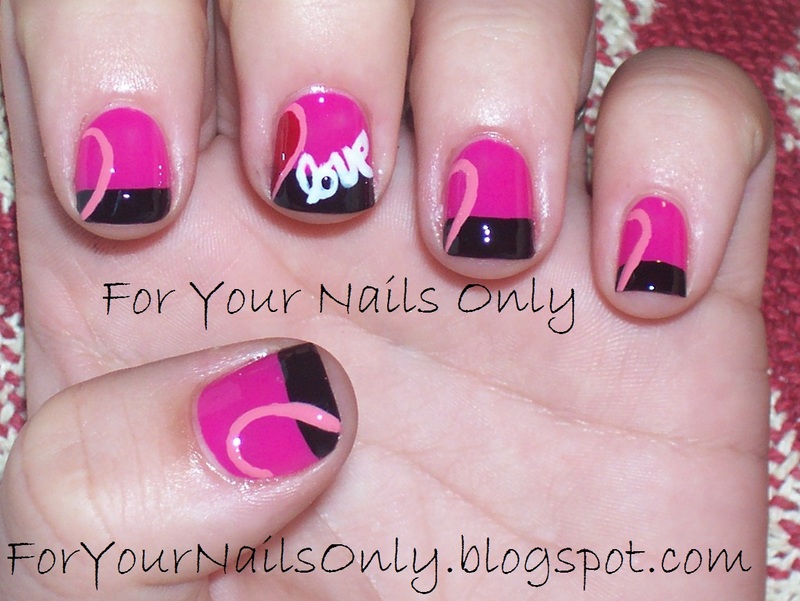 This entry was posted in Nail Art, Reviews and tagged black, creme, OPI, pink, red, Seche Vite, Sinful Colors, white by Tara. Bookmark the permalink. I hate pink, and loathe the "hallmark holiday" as well, but these look good! OMG so cool! and funny! great job!